December decisions:December is a month for decisions – what gifts to buy, what cards to send, what invitations to accept and what movies to unwind with. About a dozen wide releases will compete in December for moviegoers' time and money, but only four will arrive during the first half of the month. Actually, two of those titles will really be larger limited or semi-wide breaks that won't be playing in thousands of theatres. Two late November holdovers will also be a big factor in early December ticket sales – "The Hunger Games: Mockingjay – Part 1,"which did$82.7 million over the five day Thanksgiving period, bringing its cume to $225.7 million; and "Penguins of Madagascar,"which opened to $36 million for five days. Early December presents some special challenges to Hollywood because people are overwhelmed with holiday shopping and partying. By mid-month, people are starting to findsome time to relax with a movie. In fact, Christmas Day, itself, is now considered the perfect release date for big holiday films. Just as moviegoing is now built into how Americans spendThanksgiving weekend, it's also become part of the playbook for celebrating Christmas. For many families, a visit to a nearby multiplex is how you wind down after exchanging gifts and enjoying a special dinner – with a tub of movie popcorn for dessert! 20th Century Fox's R rated horror thriller "The Pyramid," opening semi-wide Friday at about 550 theatres, is directed by "The Hills Have Eyes" co-screenwriter Gregory Levasseur. Starring are Garsha Arristos, Joseph Beddelem and Omar Benbrahim. The story centers on a U.S. archaeological team that discovers a pyramid buried in the Egyptian desertand then becomes hopelessly lost within its twisting catacombs. While desperately seeking a way out, they realize they're not just trapped, they're being hunted! "Pyramid" isn't being tracked, but it should play best to under-25 moviegoers and, especially, to the core audience of young women who turn out for most horror genre films. Film Arcade's R rated thriller "Dying of the Light," directed by Paul Schrader ("The Canyons") and starring Nicolas Cage, Anton Yelchin and Alexander Karim, also opens semi-wide Dec. 5. Cage plays veteran CIA agent Evan Lake, who's been ordered to retire. But when evidence is uncovered thathis nemesis, the terrorist Banir (Karim),has resurfaced, Lake goes rogue,embarking on a perilous,intercontinental mission to eliminate his sworn enemy. The likely core audience for such spy thrillers is typically 25-plus males. Dec. 12 will see two wide releases enter the marketplace. Paramount's R rated comedy "Top Five" is written and directed by Chris Rock ("I Think I Love My Wife"), who stars in it with Adam Sandler, Rosario Dawson and Kevin Hart. It's the story of New York comedian-turned-film star Andre Allen (Rock), whose unexpected encounter with a journalist (Dawson) forces him to confront the comedy career and the pasthe's left behind. "Top" is tracking best with 25-plus females and nearly as well with men and women under-25. 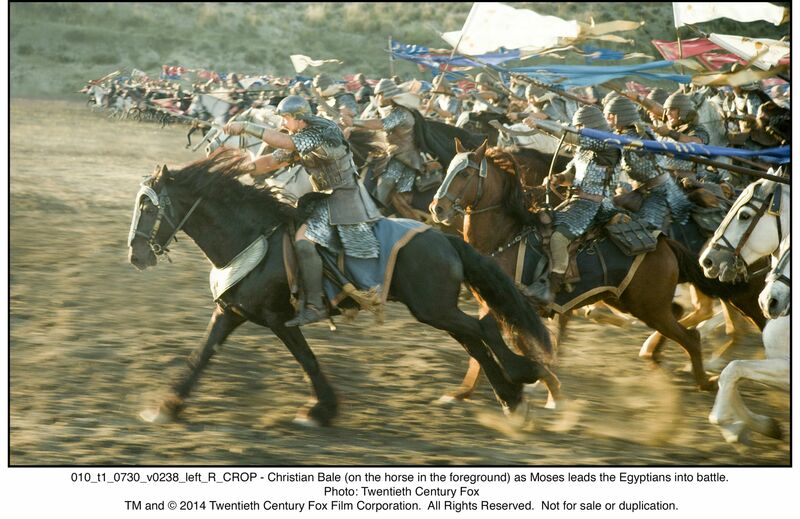 The weekend also will see 20th Century Fox launch its 3D epic adventure "Exodus: Gods and Kings. "Directed by Ridley Scott ("Gladiator"), it stars Christian Bale, Joel Edgerton and Ben Kingsley. In "Exodus" the defiant leader Moses (Bale) rises up against the Egyptian Pharaoh Ramses (Edgerton), setting 600,000 slaves on a monumental journey of escape from Egypt and a terrifying cycle of deadly plagues. While "Exodus" is an original film, it should benefit from being a story that's very familiar to audiences worldwide, which is the great advantage franchise episodes always have. It's tracking best and equally well with men and women over 25. The much anticipated concluding episode of the franchise"The Hobbit: The Battle of the Five Armies"opens wide Wed., Dec. 17 from Warner Bros., New Line Cinema, MGM and WingNut Films. "Armies"concludes the adventures of Bilbo Baggins (Freeman), Thorin Oakenshield (Armitage) and the Company of Dwarves. Having reclaimed their homeland from the Dragon Smaug, the Company has unwittingly unleashed a deadly force into the world. Smaug, in a rage, rains his fiery wrath down upon Lake-town's defenseless population. Thorin, obsessed with his reclaimed treasure, sacrifices friendship and honor to hoard it while Bilbo's efforts to make him see reason drive the Hobbit towards a desperate and dangerous choice. Even greater dangers lie ahead. Unseen by any but the Wizard Gandalf (McKellen), the great enemy Sauron has sent forth legions of Orcs in a stealth attack upon the Lonely Mountain. With darkness converging on their escalating conflict, the Dwarves, Elves and Men must decide whether to unite or be destroyed. Bilbo finds himself fighting for his life and the lives of his friends as the future of Middle-earth hangs in the balance. 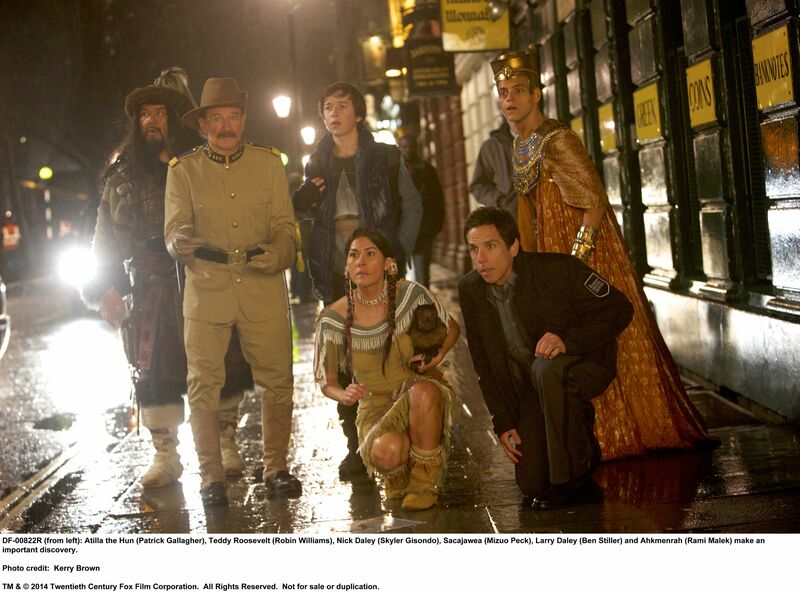 Fox's PG rated family comedy adventure "Night at the Museum: Secret of the Tomb," opens Dec. 19. Directed by Shawn Levy ("Night at the Museum" and "Night at the Museum: Battle of the Smithsonian"), it stars Robin Williams, Dan Stevens and Ben Stiller. The franchise's first two episodes grossed $428.1 million at domestic theatres. In this episode, Stiller's hapless security guard character Larry travels to London's British Museum, attempting to find anancient Egyptian tablet. Also arriving Dec. 19 and targeted to family audiences is ColumbiaPicturesand VillageRoadshowPictures' musical comedy drama "Annie." Directed by Will Gluck ("Easy A"), it stars Jamie Foxx, QuvenzhaneWallis and Rose Byrne. Hollywood's last version of "Annie" opened in limited release May 21, 1982 and went wide June 18 with $5.3 million at 1,102 theatres. It wound up grossing $57.1 million domestically, which was big money back then. In this contemporary retelling of "Annie," an orphan (Wallis), who's been living witha meanfostermom(CameronDiaz), is adopted by a hard-nosedtycoon andNewYorkmayoralcandidate(Foxx) and eventually manages to win his heart. The multiplexes really heat up starting Dec. 25 since the period between Christmas through New Year's weekend is one of the busiest moviegoing times of the year. Hollywood's movie presents under the tree include Disney's PG rated family fantasy comedy "Into the Woods." Directed by Rob Marshall ("Chicago"), it stars Anna Kendrick, Meryl Streep and Chris Pine and is based on the hit musical play by Stephen Sondheim and James Lapine. "Woods" is a contemporary twist on the classic Brothers Grimm fairy tales, intertwining several stories and exploring what happens to thefamiliar characters.It follows such classic characters as Cinderella (Kendrick), Little Red Riding Hood (Lilla Crawford), Jack and the Beanstalk (Daniel Huttlestone) and Rapunzel (MacKenzie Mauzy), who are all linked by an original storyline about a baker and his wife (James Corden and Emily Blunt), who are so eager to start a familythat to make it possible they strike a deal with a witch (Streep). her a few things – including, Little Red Riding Hood's cape, the milky-white cow from Jack and The Beanstalk, Cinderella's slipper and some ofRapunzel's golden hair. To do so, the baker must travel into thedark and mysterious woods andbattle the giant from Jack and The Beanstalk, who threatens to destroy the entire village. "Woods,"which opened on Broadway Nov. 5, 1987 at the Martin Beck Theatre, ran for 764 performances and won Tony Awards for best score, book and actress in a musical. It also received five Drama Desk awards, including best musical. Universal and Legendary Pictures' PG-13 biographical action drama "Unbroken"also opens wide Dec. 25. Directed by Angelina Jolie ("In the Land of Blood and Honey"), it stars Jack O'Connell, Domhnall Gleeson and Jai Courtney. There's been an early Oscar buzz underway for months about "Unbroken" and Jolie's prospects for getting a best directing nomination. She won a supporting actress Oscar in 2000 for her performance in "Girl, Interrupted." Columbia Pictures' R rated action comedy "The Interview"is also on deck for Christmas Day. Directed by Evan Goldberg & Seth Rogen, who co-directed the 2013 fantasy comedy "This is the End," it stars James Franco, Seth Rogen and Randall Park. In "Interview," Dave Skylark (Franco) and his producer Aaron Rapoport (Rogen) run a popular celebrity tabloid TV show called "Skylark Tonight." When they learn that North Korean dictator Kim Jong-un loves their show, they manage to arrange to interview him, which would legitimize themselves as journalists. Just as they're getting ready to visit Pyongyang, the CIArecruits them to assassinate Kim, an assignment they're probably less qualified than anyone to carry out. The Weinstein Company and Tim Burton Productions' PG-13 rated biographical drama"Big Eyes" will also be hitting multiplexes across the country Dec. 25. Directed by Tim Burton ("Alice in Wonderland"), it stars Amy Adams, Christoph Waltz and Krysten Ritter. "Big" is based on the true story of artistMargaret Keane (Adams) and her husband,Walter (Waltz), who took credit for his wife'spaintings while she worked in obscurity. Paramount Pictures and Winkler Films' R rated crime thriller"The Gambler" is directed by Rupert Wyatt ("Rise of the Planet of the Apes") and stars Jessica Lange, Mark Whalberg and Brie Larson. Whalberg plays Jim Bennett, anEnglish professor and a high-stakes gambler, who bets everything when he offers his life as collateral to a gangster's loan. Always one step ahead, Bennett pits his creditor against the operator of a gambling ring,, leaving his dysfunctional relationship with his wealthy mother in his wake. He plays both sides, immersing himself in an illicit, underground world while getting attention from a loan shark (John Goodman) who takes a paternal interest in Bennett's future. Then, as his relationship with a student deepens, Bennett must take the ultimate risk for a second chance. Besides these wide releases, Dec. 25 will also see the arrival in limited release of two very high profile dramas that are already generating big Oscar buzzes and will go wide in early January. Paramount and Plan B Entertainment's historical drama "Selma,"is directed by Ava DuVernay ("Middle of Nowhere") and stars David Oyelowo, Carmen Ejogo and Tom Wilkinson. The wide release of this story about Dr. Martin Luther King Jr., LBJ and 1960s civil rights marches is set for Jan. 9. That will put it the national spotlight ahead of the Jan. 19 Martin Luther King Jr. holiday. "Selma's" general subject matter has resonated in the past with Oscar voters and could very well do so again as they think about this year's best picture race. Among its producers are Brad Pitt and Oprah Winfrey, both of whom will be a big help in getting Academy members to make time to see the picture. Warner Bros. and Village Roadshow's R rated biographical action drama "American Sniper,"also opening Dec. 25 in limited release, is going wide Jan. 16. Directed by Clint Eastwood ("Million Dollar Baby"), it stars Bradley Cooper, Sienna Miller and Jake McDorman in the true story of U.S. Navy SEAL Chris Kyle (Cooper) with over 150 confirmed kills to his credit. Eastwood is a longtime Academy favorite with four Oscar wins to his credit – best picture and directing in 1993 for "Unforgiven" and best picture and directing in 2005 for "Baby." Kyle is sent toIraq to protecthis brothers-in-arms. His pinpointaccuracy as a sniper saves countless lives on the battlefield, earning him the nickname Legend.However, when his reputation also grows behind enemy lines, a price is put on his head, making hima prime target of the insurgents. toll on his family at home, he serves four harrowing toursof duty in Iraq. But upon returning to hiswife (Miller) and kids, Kyle finds it is the war he can’t leave behind. Bottom line:December's big decisions include which films to enjoy over the holidays.